The Shocking TRUTH about "QUEER" Men! World War III Threatens to EXPLODE in Middle East! Long-time director of the Spanish work. In nations or individuals, things like wealth, position, education, intellect, natural abilities and talents seem very important but in fact count for very, very little without character. And the interesting thing about character is that basically it is not hereditary; it is not inborn, it is something you have to developed. When you reflect that character is the only thing that you will take with you from this life into the life that is to come, it comes to be extremely important. It is vital. 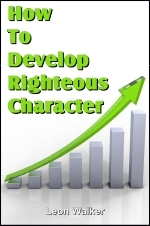 So, how do we develop that holy, righteous character that God wants us to have? And, so we can understand that: What is character? Rather than try to define it, I'll describe character as basically ability in self-discipline and self-control. This obviously implies choosing the right direction for your life, then forcing yourself to go that way. That's what character is all about. Let's look at the ingredients necessary to develop character. First of all, we have to have freedom of choice, to choose the way we're going to go. This means that there have to be alternatives. If you can only go one way, you can't develop character. Let's look at the example in Genesis 2:16-17. All the essential ingredients to develop character are there. "And the [Eternal] God commanded the man, saying, of every tree of the garden thou mayest freely eat: But of the tree of the knowledge of good and evil, thou shalt not eat of it: for in the day that thou eatest thereof thou shalt surely die." First, God commanded or instructed the man, told him what he should do. God did not force man to go a certain way or restrain him from going the wrong way. But the definition of right and wrong was given to him, and he was warned of the wrong way: "In the day that thou eatest thereof thou shalt surely die." The opportunity to eat of the wrong tree was certainly there. So, man — and woman — was free to choose. Then, as you read on in chapter 3, serpent comes up to Eve, and she eats the forbidden fruit, and Adam eats. But what was God doing when all that was going on? What if you or I had been there? What would we have done if we had been in God's place? Some of us would have been like the "B.C." comic strip character. We would have used a club — bam, bam, bam — on the head of the serpent, as soon as he said the first word. Perhaps we would have grabbed Adam and Eve and shook them and not allowed them to sin. But God stood back and heard everything, saw everything and did nothing to stop it. God did not stand over them with a rod or with a whip to prevent them from sinning. From the point of view of character, Adam and Eve used no self-discipline, no self-control. Neither of them did anything to stop their desire to take of the fruit and eat it. No character was developed. As a matter of fact, they were worse off than before because they established a pattern for themselves and their children after them of doing things their way, rather than as God told them to do. We find here, very clearly, that the right choice would have led to right character development. But they chose to make the wrong decision, and they paid the penalty for it. But I want to stress that God gave them the freedom to make that choice. You see, God had to find out sooner or later what they were going to do. God is not merely concerned with the actions of individuals, but with children who are to be born into His Divine Family able to rule and lead and carry out His instructions totally and completely. We as individuals are constantly faced with choices. We come up with situations every day in our lives in which we are confronted with an alternative or a series of alternatives. And so, we have to make a choices between those things to determines whether or not in fact we will develop character in the process. Galatians 4:1: "Now I say, That the heir [the one who is to inherit the father's position and wealth], as long as he is a child, differeth nothing from a servant [the word servant in the Greek actually means slave], though he be lord of all" — potentially master of everything when he grows up. Like a slave, he "is under tutors and governors until the time appointed of the fathers." How many of us remember complaining as a young person in the family: "I'm treated just like a slave around here. I don't have any freedoms." You know, it's true. Because a child obviously is not mature enough to have the freedom to do as he pleases. A 3- or 4-year-old must be told what time to go to bed, perhaps even put to bed, told what time to get up and be given a balanced diet instead of the ice cream and candy he would choose if he had total freedom. But when the child matures, through education, discipline and training he learns to make the right decisions in his life. Then he is given more freedom and, of course, learns that responsibility goes with that freedom. So you and I are faced with choices constantly in which we have to look at the situation before us and determine what we are going to do. Will we yield to the pressure of our friends, of society, of our own human nature? We are free. No one's going to stop us unless it's illegal or hurts others. It is up to us as to whether we build character or tear down even what our parents helped us build. We read in Romans 1:19-23, "Because that which may be known of God is manifest in them [the human race]; for God hath shewed it unto them." Now God has not shown all of His spiritual truth to man, but He has shown him many things, even certain basic laws of morality. Every society has knowledge of that. "For the invisible things of him from the creation of the world are clearly seen, being understood by the things that are made, even his eternal power and Godhead; so that they are without excuse: Because that, when they knew God [at one time they did], they glorified him not as God, neither were thankful; but became vain in their imaginations [reasonings], and their foolish heart was darkened. Professing themselves to be wise, they became fools, And changed the glory of the uncorruptible God into an image made like to corruptible man, and to birds, and four-footed beasts, and creeping things." They made the choice: "I don't want God in my life, I will not express my gratitude and appreciation to Him, I will not humble myself before God, I want nothing to do with Him. I reject Him in my life." So God said, "Okay, if you want to do that, go ahead." Then God "gave them up to uncleanness," allowed them to go that way of following their own desires. We find here a principle of God: God does not compel man to follow His ways. He teaches. He shows. He commands. But He certainly does not compel or force one to go that way. But we do find bad results of mankind's wrong choice in our world today: sexual uncleanness, even homosexuality and lesbianismand so on, as we find in verses 26-27: "For this cause God gave them up unto vile affections: for even their women did change the natural use into that which is against nature: And likewise also the men...."
Instead of building character, mankind has made for itself a curse. Verses 29-31: "Being filled with all unrighteousness, fornication, wickedness, covetousness, maliciousness; full of envy, murder, debate, deceit, malignity, whisperings, Backbiters, haters of God, despiteful, proud, boasters, inventors of evil things, disobedient to parents, Without understanding, covenant-breakers, without natural affection, implacable, unmerciful..."
Yes, you're free. But with that freedom, you have responsibility. Jesus was free when tempted on the mount, recorded in Matthew 4. He was faced with a choice: The easy way that Satan was offering or the hard way. So he exercised self-control, self-discipline, to make the right decision and follow right things. Now this leads to another aspect: Character developmentimplies you accept the responsibility for your decisions. Let's go back to Genesis 3:12, with the case of Adam and Eve. God faced the man first of all, and Adam said, "The woman whom thou gavest to be with me, she gave me of the tree, and I did eat." He didn't accept any responsibility. Verse 13: "And the woman said, the serpent beguiled me, and I did eat." Adam put all the blame on Eve, partly on God. The woman blamed the serpent. And as the saying goes, the serpent didn't have a leg to stand on — no one to blame. Now, you know something? My kids have never done anything bad in their lives. It's always "Johnny did it. I just did what Johnny did." They express the same human nature that was in Adam and Eve. Peer pressure always turns out to be the culprit. Somebody else did it, or "Everybody does it." So "They're really to blame, I'm not." But this is no excuse. However strong the influence of your mate, your girl friend, your boyfriend, your friend or your parents, it is your responsibility because you made the choice. You have to answer for it. Romans 14:12, "So then everyone of us shall give account of himself to God." We need to understand how we are influenced by peer pressure and be on our guard. Choose your friends in other words, because they are going to have an impact on you. Choose those who can be a right example, If you choose the wrong kind of companions, they're going to have a bad influence upon you. I Corinthians 15:33, " Be not deceived: evil communications [associations, as it ought to be rendered] corrupt good manners." Galatians 6:4-5: "But let every man prove his own work [put yourself to the test, because you will answer if you do wrong], and then shall he have rejoicing in himself alone, and not in another." You can have the right satisfaction in the character you have developed, the right choice that you made under the circumstances. Paul goes on to say, "Every man shall bear his own burden." And in verses 7 and 8: "Be not deceived; God is not mocked: for whatsoever a man soweth, that shall he also reap. "For he that soweth to his flesh shall of the flesh reap corruption [no character]; but he that soweth to the Spirit shall of the Spirit reap life everlasting." We come to another point then: Character development by definition is always difficult. In Matthew 7:13 Christ talks about the Christian way: "Enter ye in at the strait [very narrow, constrictive, hard-to-squeeze-through] gate." It takes effort to do so: "...for wide is the gate [that's the other choice we could make], and broad is the way, that leadeth to destruction, and many there be which go in thereat." So that's the way the Bible describes it. The Word of God gives us many analogies of the Christian life, such as mastery of the body, warfare, pulling down strongholds. And all of these things indicate struggle, sweat, effort, work, labor. It's never defined by easy, float, coast and so on. Maybe we can understand a bit of the reason. Quoting from a book on physical exercise about how physical strength is developed. I quote: "Strength may be defined as the ability to exert force against a resistance. The only way to increase strength is to cause a muscle to pull against heavy resistance." I'm sure you see the spiritual parallels. The only way we can develop spiritual strength, spiritual character, is to exercise the spiritual muscle against a resistance, these hard choices we have to make, the trials, tests, problems, alternatives. The apostle Peter talks about character development and strengthening and about the positive approach we should have toward it in I Peter 1:6: "Wherein [that is, in the promised incorruptible inheritance] ye greatly rejoice, though now for a season, if need be, ye are in heaviness through manifold temptations [or trials]." These test do happen to us, you know. And we're not to be deceiving ourselves by pretending it's not difficult. But what it can develop in your spiritual character is vital. That's why he says in verse 7, "That the trial of your faith, being much more precious than of gold that perisheth, though it be tried with fire, might be found unto praise and honour and glory at the appearing of Jesus Christ." I know of no greater satisfaction in life than having achieved success. If you play bridge, you know what it's like perhaps to go through the sweat, the trauma of trying to make a grand slam. But you also know the tremendous exhilaration when you win that 13th trick, which makes it all worthwhile and just gobs of fun. In the meantime it's a trauma when you're going trick after trick after trick wondering if you'll make it. And then when you finally do, the exhilaration of victory is something you have to experience. How good it really does feel, spiritually, when you meet a problem and you're successful with it. There's nothing more satisfying than that, is there? And on the other hand, I know of nothing that is more of a letdown than when you have been confronted by a temptation and yielded to it. In II Corinthians 4:7-11, Paul speaks about this difficulty that we all so often face in our life, and the kind of attitude and approach he had. "But we have this treasure in earthen vessels, that the excellency of the power may be of God, and not of us. We are troubled on every side, yet not distressed; we are perplexed [many things we may not understand], but not in despair; Persecuted, but not forsaken; cast down, but not destroyed." If we have the goal that Paul had, it becomes much easier. Verse 16-17: "For which cause we faint not; but though our outward man perish, yet the inward man is renewed day by day. For our light affliction, which is but for a moment [compared to eternity], worketh for us a far more exceeding and eternal weight of glory." Character is eternal. Again a rather classic scripture, I Corinthians 9:24-27: "Know ye not that they which run in a race run all, but one receiveth the prize? So run, that you may obtain. And every man that striveth for the mastery [or as my margin has, everyone who exercises self-control — character development, right choices, determination to train himself for the Kingdom of God] is temperate in all things. Now they do it to obtain a corruptible crown; but we an incorruptible. "I therefore so run, not as uncertainly; so fight I, not as one that beateth the air. But I keep under my body, and bring it into subjection [the self-discipline and control again that is part and parcel of character]: lest that by any means, when I have preached to others, I myself should be a castaway." There is , finally, one other ingredient we need to develop holy, godly, righteous character which I have not mentioned. We must have power from God — His Holy Spirit. But that is another whole sermon.